For holidaymakers searching for a destination which is a little different to Spain (but not too different), look no further than the Algarve in southern Portugal. Although the Algarve has Atlantic rather than Mediterranean coastline, the climate is similar to Spain, which means summers of guaranteed warm sunshine, warm springs and autumns, and mild winters. Most of the Algarve resorts are family-friendly, and the beaches are a match for any across the border in Spain, but the sea temperatures are much cooler than in the Mediterranean. The cost of eating out in the Algarve is comparable to Spain, and you can eat out for under € 10 per person if you search around for menus of the day (Prato do Dia). If you are looking for a quiet holiday then steer clear of Albufeira which is "tourist central". Generally, it is best to head further to the west to find the quieter resorts, especially if you avoid high season (July-August), but the western Algarve tends to have beaches which have steep gradients, so this is worth considering of you have small children. The Algarve's largest resort Albufeira could be described as the Benidorm of the Algarve. If you are looking for a bustling nightlife with excellent beaches, then Albufeira is certainly the place to go. Albufeira is busy for most of the year unlike many of the other smaller resorts. If you want to stay somewhere where the action continues "24/7", then base yourself around the area known as "The Strip". Albufeira strip is a single street lined with bars restaurants and nightclubs with a huge sandy beach at the bottom of the hill. Beware as there is quite a steep hill leading down to the beach. 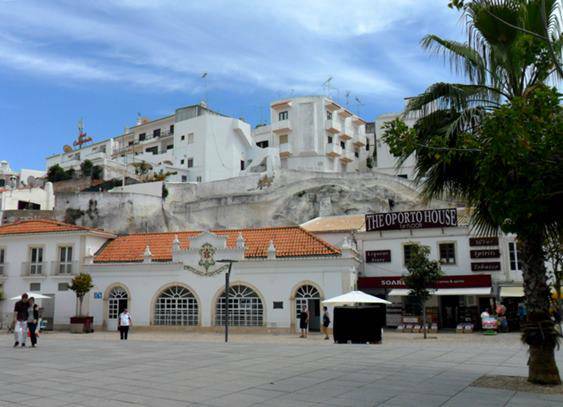 The old town area of Albufeira is more sedate than the Strip, and the narrow streets and picturesque plaza offer an insight into how the town was before the days of the tourist shops, bars and restaurants. The old town has all manner of tourist shops, bars and restaurants to absorb your holiday money. The picturesque main square at the centre of the old town is a sedate place to enjoy an afternoon coffee or local Portuguese beer in the sun. The pretty cobbled streets and whitewashed houses of Alvor on the western Algarve have made the town a popular year-round destination for visitors. Although the town has been developed by tourism, Alvor has retained much of its authenticity, and it is not hard to imagine how it was 50 years ago when it was a small fishing village. The highlight of the town is the 500-year-old Church of Divino Salvador which is open to the public. 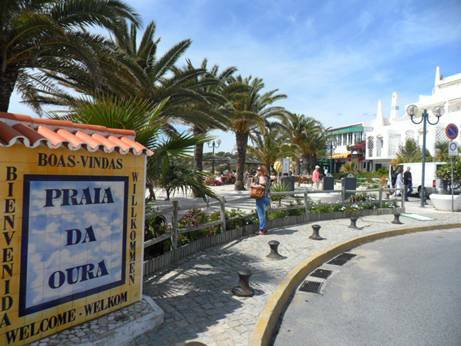 Alvor is very family-friendly and ideal for visitors with young children or for older visitors. Walkers will love the miles of board-walked paths which follow the coastline, and the beaches are renowned for their spectacular rock formations. Carvoeiro is one of the more "up-market" resorts of the Algarve providing a quiet base for a holiday which makes it especially popular with families. Located in the western Algarve, Carvoeiro is an attractive white-washed town built on a hill above a single, picturesque sandy beach. For families, Carvoeiro is home to the Zoo Marine Theme Park which will keep the kids entertained for a day. There is discounted entry to the park during the spring and autumn. Carvoeiro beach gets very busy in summer, but the town is worth visiting out of season when the Algarve temperatures are usually 10 or so degrees higher than in the UK. For a weekend city break at any time of year it is worth considering the historic Algarve capital Faro. 10 minutes by taxi from Faro Airport means there is little time wasted in airport transfers, and the centre of Faro has hotels catering to all budgets. If you are looking for a beach resort Praia de Faro is only 5 minutes by taxi from the airport and has excellent beaches although the area is not ideal for children as the water gets deep very quickly. Faro centre has a historic old town, an attractive marina and a good range of shops, bars and restaurants. Forum Algarve on the road to the airport is the best place for shopping in Faro with designer stores and plenty of fast food restaurants where you can grab a cheap meal. Find out more about the city in our Guide to Faro. 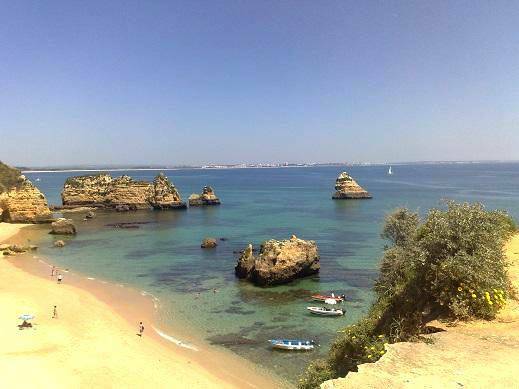 Lagos is in one of the most picturesque areas of the western Algarve. Lagos is probably best known for its rock formations which form the backdrop for many of the postcards from the resort. Lagos is a busy town centred on the tourism industry, but still retains much of its heritage in the old town and port area. Lagos is a good base for families, offering plenty of activities in addition to some of the best beaches in the Algarve. Boat trips around the rocks, diving, fishing, walking and water sports are some of the most popular activities. Upside: Huge sandy beach, which is ideal for children, busy all year round even in winter and close to Spain. Warm sea water temperature. Monte Gordo is the closest large resort to the Spanish border, being around a 10-minute drive. The resort attracts many winter visitors from northern Europe, which means you can stay here at any time of year and find plenty to do. Speaking a little German may be an advantage if you want to mix with the other clientele. The beach at Monte Gordo is huge, it is around 100m from the beach edge to the water which means beach space is always easy to find unlike at some of the other smaller resorts. There are several bars and restaurants on the beach itself, and plenty more lining the long, palm-lined promenade. Here you can enjoy a meal, and in the evenings listen to traditional Portuguese Fado music at some of the bars, although you may be charged a small entry fee where. Being situated a few kilometres from Spain, day trips to Ayamonte, Huelva and even Seville are alternatives to the beach. Recommended: Matias Restaurant located on the beach at Vale de Lobo offers local seafood, grilled food and exquisite hand-made deserts at reasonable prices. For visitors searching for an up-market and rather exclusive holiday setting, the adjacent resorts of Quinta do Lago and Vale do Lobo are set in tranquil, coastal pine forests within walking distance to some of the Algarve's finest beaches. Quinta do Lago and Vale do Lobo are especially popular with golfers, there are 2 of the top courses in the Algarve located on the doorstop. Both resorts have private communities and villas, but many properties are available for holiday rental, and there are some excellent hotels on both resorts, although you can expect to pay around double the price compared to Albufeira for example. There are on-site shops, bars and restaurants, and the resorts have the advantage of being only a 15-minute drive from Faro Airport. The attractive town of Silves is a good choice for visitors to the Algarve who prefer a quiet, historic location rather than a beach resort. The town was built on a hill, protected by the Moorish Silves Castle which is a popular tourist attraction. Silves is only 15-minute drive from the local beaches, so makes a good base for anyone wanting to experience an authentic Algarve town but still be within easy reach of popular resorts such as Carvoeiro and Lagos. Tavira is the largest resort in the eastern Algarve. Located towards the Spanish border, Tavira was until the late 1980's primarily a fishing port but has flourished as a tourist town. 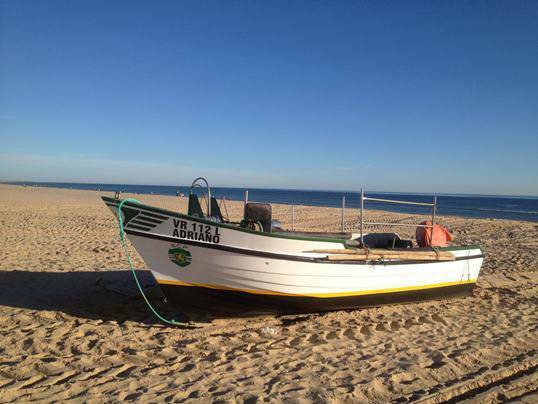 Built on the River Sequa which leads out to the Atlantic via the Ria Formosa delta, Tavira is located on an estuary and although the town has beaches, the best of the beaches a short 5-minute ferry ride (or river taxi ride) away on the idyllic Tavira Island. However, the beaches on the island are some of the best in the Algarve. If you don't mind camping, Tavira Island has a large campsite which is popular with backpackers. Prices are quite high in summer, but much better value outside July and August. Vilamoura is one of the more exclusive resorts of the Algarve. The focal point of the resort is the marina which is surrounded by bars, clubs, shops and restaurants. Vilamoura attracts golfers from around Europe due largely to the Oceanico courses. Vilamoura has 2 large, sandy beaches, with Falesia beach stretching all the way to Albufeira to the west. 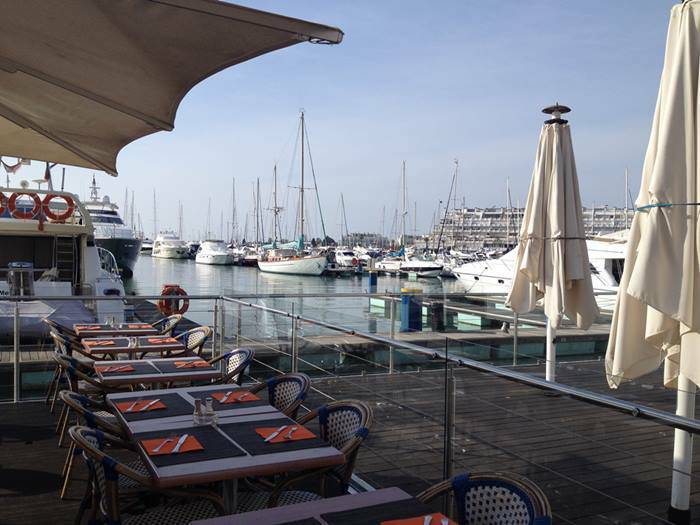 Don't Miss: Luis Figos bar "Setecafe Vilamoura" which is located in the marina. One of the main reasons people cite when choosing the Algarve as a holiday destination is the food. Local fish dishes based on sardines and shell fish are extremely popular, and the local seafood stews served with rice (Arroz Marisco) are an Algarve speciality. 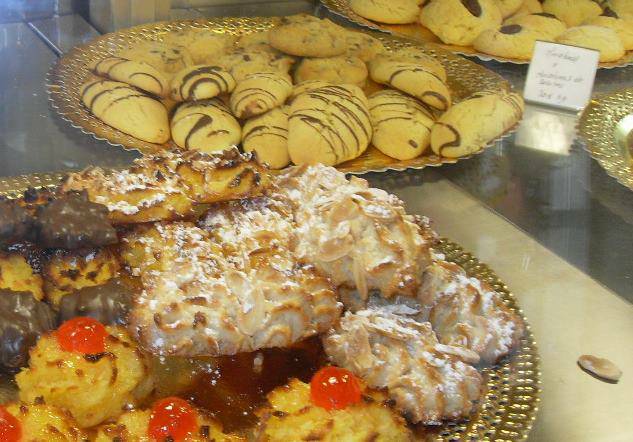 For those with a sweet-tooth, the local bakeries (pastelarias) sell some fantastic local breads, croissants, cakes and sweets. If you don't want a hotel breakfast, the pastelarias offer a great alternative, with a coffee, freshly-squeezed orange juice and croissant (often filled with ham or cheese) coming to less than 5 € per person. Visitors to the Algarve are spoilt for choice for wines. The red wines tend to come from further north from areas such as the Douro valley where there is more rain but are still very cheap in the Algarve. A refreshing drink is the green wine (a sparkling white wine) which also comes from further north in Portugal. Portuguese beer such as Sagres and Superbock can be found in many bars and restaurants for around half the price of an equivalent. If you want to try a local drink, Alfarroba liquor is an Algarve concoction made from the pods of the carob tree. TIP: Check out where the locals eat to get the best quality and value. Faro Airport is located a few kilometres from the centre of Faro. Most of the local airlines fly to Faro year-round. Protected wetlands at Salgados in the Western Algarve are under threat from a large tourist development. Please take a few minutes to sign a petition to help protect one of the Algarve's few remaining wetland nature reserves.